I hope it survives. 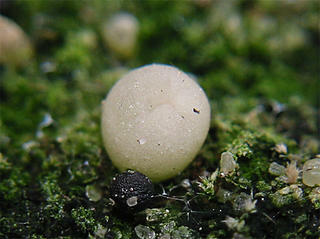 You are very lucky to get an albino, I would love to see its growth progression. Keep us updated. Unfortunately it didn’t survive. I must have crushed too many cells when cutting the delicate seedling (even though I’m using a surgical scalpel for grafting). Today it’s flat and dry, almost looking like a miniature dried jellyfish stranded on top of a Pereskiopsis. Thats to bad. A seedling I grafted onto opuntia a couple of days ago died too. 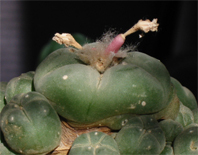 Seems like we ought to attend a grafting class ;-) I’ve no experience grafting onto Opuntia yet, but last year I sowed O. compressa and plan to follow Valentino Vallicelli’s grafting instructions.